Although Dao An’s Sifu was surprised, he still did not really believe that Dao An could remember the whole sutra. Since Dao An had asked for another sutra to read, his Sifu wanted to test him to see if he really had a very good memory or even a photographic memory. He gave Dao An the Bright Sutra成具光明經, which has about 10,000 words. Dao An thanked his Sifu and took it with him and went back to the fields to do his work. Once again Dao An would read the sutra in his free time. That night he went back to his Sifu again and his Sifu was really shocked! He thought it would take a few days to read the whole sutra, but Dao An in the same amount of time as before, had finished reading the entire sutra even though it was much thicker and had many more words. Again, Dao An’s Sifu tested him on the sutra and again Dao An was able to answer every question and could recite the sutra off by heart! This time his Sifu was very happy. 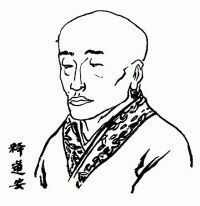 Although Dao An was not good looking, he had a very good talent and he would be better spending his time studying Buddhist knowledge rather than doing physical work. So from then on Dao An stayed in the temple library and studied all the Buddhist sutra’s in it.